Is your hair not growing healthy? Do you have split ends that you have to cut occasionally, and does your hair refuse to grow beyond a certain length? Then it is time that you start taking more care of your hair and give it special treatments. First of all check whether the hair care products that you use are suitable for your hair type. If they contain too much of chemicals, stop using them and turn to DIY home remedies. These contain natural ingredients that do not harm your hair in any way. 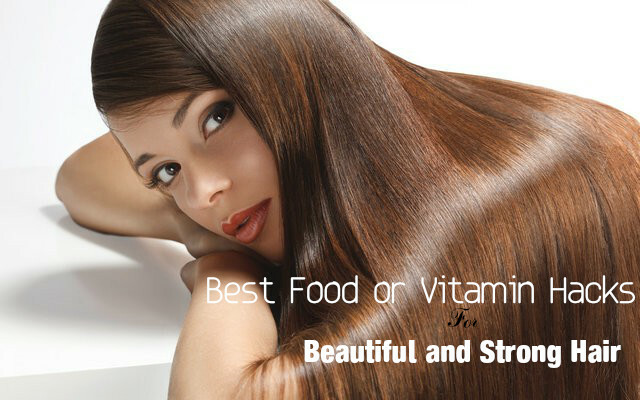 In this article we will discuss about some Vitamin Hacks for strong and beautiful hair. After you remove all hair products containing chemicals in them, the first thing you must do is to have a DIY shampoo, which is easy to make and very effective for your hair. Take one part of baking soda and mix it with 3 parts of water and one or two drops of Vitamin E oil. Mix them well in a bottle and your shampoo is ready. As you have seen, this shampoo is very easy to make and does not take much time. It is very effective and removes dirt easily. However, it does not foam. During the first two weeks or so, you may feel that your hair is slightly oily. This is because the scalp takes time to adjust to this natural form of shampoo, whereas earlier it was stripped of its natural oils with the use of foaming shampoos with chemicals in them. After you rinse your hair well, apply a conditioner. Take one part of apple cider vinegar and mix it with 4 parts of water and one or two drops of essential oil. You can choose your favorite essential oil for this. Lavender, vanilla, sandalwood etc are some of the essential oils that you can choose. Mix them well and then apply the conditioner all over your hair after you tilt your head forward. Rinse well with cold water. This will give more shine and moisture to your hair. You can also avoid split ends by applying this conditioner. If you use only soda and ACV, your hair may turn a little dry after some time. So you have to use another shampoo, which is full of Vitamin E, like castile soap. Castile soap is natural and you get it in liquid and solid form. It contains jojoba oil, olive oil or hemp oil, which along with Vitamin E help in nourishing your hair. You can decide which shampoo to use more often depending how oily your hair is. Using these two shampoos alternately will help in making your hair strong and shiny. To get rid of split ends, apply olive oil or coconut oil on the entire length of your hair and keep it for 30 minutes before you take bath. This will make the ends of your hair soft as well a shiny. The hot oil treatments that you get from the stores are very costly. So it is the best to make one at home. It is very easy to make. Mix 1 cup of olive oil with 2 tablespoons of ghee and apply it on your damp hair. Let it remain on your hair for 20 minutes and then wash with DIY shampoo and water. As you know, hair is made up of protein. So protein helps in making your hair strong. You can get protein from various plant sources like hemp, lentils, green vegetables, nuts and nut butters, beans, quinoa etc. If you are not a vegetarian, then you can get protein from fish, lean chicken or beef, Greek yogurt and so on. Omega 3 fatty acids have the properly to make your hair look silky and shiny. To get enough of omega 3 fatty acids, include the following food items in your daily diet – flax seed and oil, chia seeds, soya beans, avocado, walnuts or fatty fish such as mackerel and salmon. You also have the option to take its supplement daily in the form of 1 gm of DHA and EPA. If you have a flaky scalp, magnesium oil gives the best treatment. Apply this oil on your scalp and massage well with your finger tips. Wait for 10 minutes and then rinse off. This cleans your scalp and the hair follicles, so that thin hairs start to grow stronger. Vitamin D promotes hair growth. You do not get enough vitamins from the food you eat. So you can take vitamin D supplements to make sure that you get 1,000IU of this vitamin daily. Vitamin B is essential for your skin, nails and hair. You need to take it daily as this vitamin is water soluble and is washed out with water. Some of the food items that are rich sources of this vitamin b are soy products, fortified cereals, eggs, cheese, mussels, beef, lamb, clams, crabs etc. To have healthy hair, you need to supply your body with nutritious food. Iron and zinc are two nutrients that are needed in small quantities for the normal growth of hair follicles. So make sure that you consume food rich in iron and zinc like oats, carrots, almonds, spinach, sweet potatoes, broccoli, avocados, walnuts, chia seeds, tofu, beans, dark chocolates and so on. These foods taken along with foods rich in Vitamin C increase the absorption of iron.